A good poultry house must be weatherproof. It will ensure the poultry birds’ safety from the adverse weather conditions, for instance, cold, rain, wind, hot sun etc. The poultry house must have the conveniences of providing warmth. The house will be well ventilated and free from harmful predators. 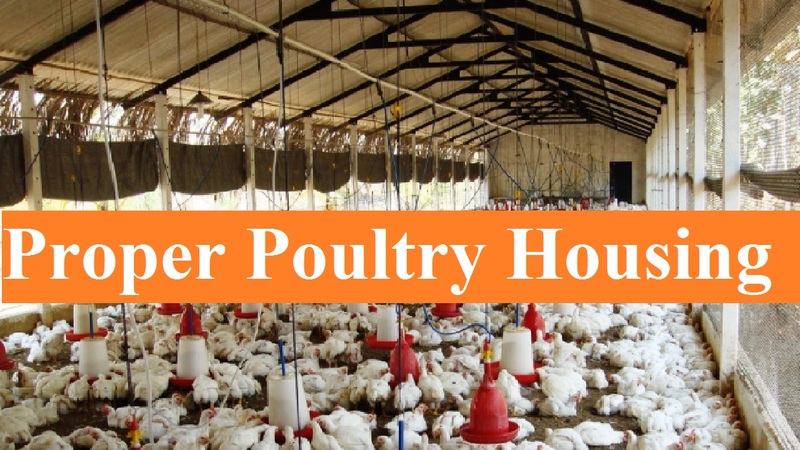 Many types of innovative poultry housing designs such as the simple house, mobile or portable house or fixed houses with the permanent foundation are used in poultry farming business. In a poultry house, you have to maintain an ideal temperature depending on the seasons. It will vary in winter and hot weather. You have to provide the bird’s ample water to maintain the balance of their body. You can keep a thermometer to measure the daily temperature of the poultry house. Proper ventilation system plays a significant role in controlling the temperature of the indoor environment. It removes moisture, heat, gas etc. and brings fresh air inside the poultry house. You can use natural ventilation or artificial ventilation system for you. In this case, you have to think of season –winter and summer (hot weather). Proper lighting is a very vital element of poultry farming. Light assists the poultry birds to be productive, seeking food and pretending them for reproduction. Besides, the poultry birds also require darkness along with the light. You can use fluorescent bulbs and incandescent bulbs for lighting. But you have to remember that fluorescent bulbs are more efficient and long-lasting than incandescent bulbs. If there is no electricity in your area or severely load shedding, you can use batteries, heriken or solar panel for lighting your poultry house. Proper litter management is very necessary for successful poultry farming and desired production. Generally, litter is made of concrete, wooden or earthen used to cover the floor of poultry housing system. It captivates the moister of the closet and weakens the manure. It is also used as the bed of the poultry birds. You can use rice hulls and softwood shavings to make the litter. Besides, you can take some other materials such as recycled newspaper, sand, dried wood fiber, chopped pine straw, peanut hulls etc. for making a litter. In small-scale poultry farm, you can use materials like hay and straw as poultry litter. Before using any material, you have to think whether the materials are healthy and compost well for poultry farm. A good litter must have 20% to 30% moisture and depth about 2 to 4 inch. There must be good ventilation to remove moisture from the litter. High moisture in a litter is never fruitful for poultry health. Wet litter is responsible for some problems like sores, and blister on poultry birds and produce ammonia gas which may cause the respiratory system of poultry. You have to use aluminum sulfate or hydrated lime to decrease ammonia gas from the litter. You can reuse the litter after drying the materials aptly. You should not use the used litter as it may have any disease. After selling the poultry, you have to remove the used litter from poultry after selling poultry. Later, this litter may be used as a good compost for agriculture. Finally, it can be said if you follow a suitable poultry housing system for your birds, you will never be regretted. Your success will be your knock at the door. So, try to follow these rules while running the poultry farm business.